A panel of national and international R&E network leaders came together recently for “R&E Networks at a Crossroads” during CENIC’s 2019 Conference. The Square Kilometer Array radio telescope — the largest scientific facility on Earth — will generate more data per day than the entire global Internet when it comes online in the mid-2020s. SKA will help search for Earth-like planets, signs of alien life, dark matter, and black holes. It will be 10,000 times more powerful than any telescope currently used. The project represents a tremendous opportunity for science, but it comes with a massive challenge to provide unprecedented computing power and historic data networking capabilities. It’s an example of the ever-increasing demands on research and education networks that serve data-intensive projects. These days, R&E networks find themselves at a crossroads with demands at all-time highs and budgets that have not kept pace. A panel of national and international R&E network leaders came together at CENIC’s 2019 Conference to discuss the challenges networks face and what they’re doing to provide the high-speed connectivity and customized services that bolster scientific discovery and promote digital access. R&E networks have helped researchers solve some of science’s biggest challenges in fields such as natural disaster mitigation, climate change, medicine, and information technology. Networks also help bridge the digital divide, and provide new opportunities for online education and workforce training. Panelists Carlos Casasús (CUDI), Louis Fox (CENIC), Jen Leasure (The Quilt), Inder Monga (ESnet), Howard Pfeffer (Internet2), and Tripti Sinha (MAX) agreed that one of the greatest assets of R&E networks is their ability to collaborate. While commercial Internet service providers are characterized by competition, R&E networks thrive because of collaboration is fundamental to their work: the science and education communities they serve are frequently unbounded by discipline, institution, or geographic borders. Moreover, by working together, R&E network members typically enjoy reduced costs, shared expertise, shared services, advanced security, increased buying power, and economies of scale. Several leading networks are on the verge of major technology upgrades to support increasing traffic demands. The Department of Energy’s ESnet, the world’s fastest network for science, has experienced exponential traffic growth and is now moving more than a petabyte of data per week. As a result, ESnet is planning its next-generation architecture, ESnet6, which will deliver up to eight times more capacity. Internet2, the nation’s largest and fastest coast-to-coast R&E network infrastructure, saw traffic increase 2,500% between 2008 and 2016. R&E networks drive innovation. Networks are designed to move huge amounts of data across the globe quickly, reliably, and securely, to accelerate scientific discovery that solves the big issues facing our world. R&E networks work together in a way that commercial providers cannot. “Research and education networks play a huge role in diminishing the gaps between the haves and have-nots,” said Carlos Casasús, director general of Mexico’s R&E network, CUDI (Corporación Universitaria para el Desarrollo de Internet). Networking can supersede politics, and provide an important model for international collaboration. Seven countries signed an agreement in March to create a global governing body for the SKA telescope array. The body was modeled after CERN, Europe’s particle physics laboratory in Geneva, Switzerland. CERN’s scientific publications and resources are open source, freely available in a highly collaborative environment. It’s public science for the benefit of society. At the center of CENIC’s work is its commitment to supporting the research and educational missions of its members. More than 20 million people, including the vast majority of K-20 students together with educators, researchers, and individuals at other vital public-serving institutions, rely on CENIC’s California Research and Education Network (CalREN) to connect with each other and the world. CENIC provides exceptional value in advanced networking based on our unique understanding and undivided attention to our users’ needs. We share our knowledge and serve as an advocate for public policy that advances broadband access for all. Watch video of the complete panel discussion, “R&E Networks as a Crossroads,” from CENIC’s 2019 conference. The Quilt will be returning to La Jolla, California on Feb. 4-7 for its 2019 Winter Member Meeting. Some of the greatest networking minds in the country will converge in California this February as The Quilt returns to La Jolla for its annual Winter Member Meeting. We are looking forward to this year’s in-person gathering of our national Quilt community and stakeholders to collectively advance networking and cyberinfrastructure for research and education. We have many exciting conversations and topics planned for you this year. We also have provided ample time between sessions for working lunch meetings and other networking opportunities. View 2019 Agenda. This year’s event kicks off with in-person meetings for our Quilt working groups and CEO Round Table as well as our quarterly meeting of The Quilt Board of Directors. We’ll wrap up the day with a networking reception hosted by Quilt CIS Program Authorized Providers at the Jolla Beach and Tennis Club. On Wednesday our general session begins highlighted by a plenary talk by Dr. David Halstead, CIO at the National Radio Astronomy Observatory (NRAO). His discussion on Network Enabled Radio Astronomy: Synthesis Imaging at 100 Tbps is one not to miss. We also will feature discussions on E-Rate, R&E Network Analytics, Security, and get an update on the National Broadband Policy. We also are looking forward to hearing about the National High School Cyber Challenge. The Quilt has joined with our member, Merit Network, to offer an opportunity to all our Quilt members to engage their connected high school communities in a national R&E cyber challenge – a competition that tests students’ skills in networking, programming and operating system security. It was developed by Merit and the Michigan Cyber Range and is being offered at no cost to schools or students. Pierrette Widmeyer and Charlotte Bewersdorff from Merit will present an overview of the competition as well as facilitate a working session later in the day. Our dynamic program wraps up its final day on Thursday with the NOAA N-Wave and RON Partner Breakfast followed by a confluence of Quilt forums and working groups as well as a round table discussion on friction-free networking for scientific research focused on cyberinfrastructure resources for researchers. If you need further information about this year’s Winter Member Meeting, please contact Jennifer Griffin. Be sure to follow us @TweettheQuilt and/or follow all conversations on social media using #QuiltinSoCal. Every November, thousands of researchers and industry representatives in high-performance computing and related fields, such as advanced networking, data storage, and data analysis, meet for the annual Supercomputing Conference (SC18) in Dallas, Texas, to learn about HPC and scientific applications and innovations from around the world. SC18 marks the 30th Anniversary of the SC Conference Series, and hasn’t been back in Dallas for 18 years. This year’s event, with the theme “HPC Inspires” is set for Nov. 11-16 at the Kay Bailey Hutchinson Convention Center in Dallas. Exhibits will be on display Nov. 12-15. Imagine the possibilities. Unlike any time in history, HPC allows us to analyze many points of data to make groundbreaking discoveries in all fields of inquiry, connecting humanity to the world around us as never before. SCinet is a truly special collaboration among more than 180 highly-skilled volunteers from about 80 domestic and international organizations. All donate their time, energy, and unique skills to the overall success of the conference, with the generous support of their home institutions. SCinet Chair Jason Zurawski is a Science Engagement Engineer at the Energy Sciences Network (ESnet) headquartered and managed by Lawrence Berkeley National Laboratory. ESnet is the U.S. Department of Energy’s high-performance networking facility. In 2004, while Jason was a computer science graduate student, he volunteered to plan, build and operate SCinet, the SC Conference’s dedicated high-capacity network. SCinet supplies exhibitors with high-capacity feeds to run all their applications in addition to providing high-speed WiFi to more than 10,000 attendees. It is a giant task and requires the best in the business to create and manage it. Read more from Jason in this blog. Quilt Members once again have joined many from the international supercomputing community to play an integral part of the annual event through demonstrations, booths, presentations and the building of SCinet. Those include: Great Plains Network (Booth 1035); Louisiana State University (Booth 1816); University of Utah (1828); Pittsburgh Supercomputing Center (2028); NCAR (Booth 2000); Indiana University (Booth 2400); Ohio Supercomputing Center (Booth 3037); Starlight (Booth 2851); and Pacific Wave (Booth 3158), just to name a few. Five women IT professionals have been selected to participate in the “Women in IT Networking at SC” (WINS) inclusivity program at SC18. They will join peers from around the globe to help build and operate SCinet. In recognition for its work to provide professional development opportunities to highly-qualified women in the networking field, the WINS program received the 2017 Innovations in Networking Award for Experimental Applications presented by Quilt Member, CENIC. Read more about it. This year’s WINS review committee was led by Wendy Huntoon of KINBER and included Carrie Gates of Securelytix, Eli Dart of ESnet, Dave Jent of GlobalNOC and the Quilt, John Kolb of Rensselaer Polytechnic Institute, Amy Philipson of Pacific Northwest Gigapop, and Linda Winkler of Argonne National Laboratory. WINS is funded by the NSF and the Department of Energy. It was initiated in 2015 as joint effort between ESnet, the Keystone Initiative for Network Based Education and Research (KINBER), the University Corporation for Atmospheric Research (UCAR), and SCinet. As of 2018, WINS has funded 24 women to participate in SCinet. Real-time event conversations can be found @Supercomputing on Twitter or using #SC18. If you or others from Quilt Member institutions plan to attend SC18, we would like to hear from you and your experience for a future blog. Please contact us or Tweet us @TweetTheQuilt. The Quilt is pleased to offer recommendations for a new USDA program created to expand rural broadband in underserved rural and tribal areas throughout the United States. A new rural broadband program funded within the Consolidated Appropriations Act of 2018 now authorizes the U.S. Department of Agriculture’s (USDA) Rural Utilities Service (RUS) to distribute $600 million through the “e-Connectivity” pilot that targets support in the form of grants and loans. In July, U.S. Secretary of Agriculture Sonny Perdue invited comments on the implementation of the e-Connectivity Pilot Program, and The Quilt responded on behalf of R&E networks across the country. According to a 2018 report by the FCC, approximately 19 million rural American households do not have reliable, affordable, high-speed internet access. Without e-connectivity, the report noted, rural Americans cannot reach their full productivity in the workplace, receive the best education, nor benefit from the highest quality of health care. USDA is developing this pilot to catalyze private investment and bring broadband to unserved rural areas of the country. The new program provides a unique opportunity to develop modern methods to leverage federal funds that increase private investment in broadband services for as many rural American homes, businesses, farms, schools, and health care facilities as possible. R&E networks play a vital and expansive role in their respective broadband landscapes. RUS should prioritize e-Connectivity Pilot Applications that include connectivity to Community Anchor Institutions (CAIs) and tribal lands. The e-Connectivity Pilot should consider the broadband needs of communities and regions, not just census blocks. The e-Connectivity Pilot should fund middle-mile infrastructure where necessary to deliver sufficient broadband access to residences and CAIs. The program should measure broadband access, affordability, and performance (noting a recent submission to the NTIA on how to improve the quality and accuracy of broadband availability data by one of our member networks, Merit, filed jointly with The Quello Center at Michigan State University). Please see our previous blogpost on this official submission. DOWNLOAD THE QUILT’S FULL SUBMISSION TO USDA RUS. USDA Rural Development provides loans and grants to help expand economic opportunities and create jobs in rural areas. Gaining expert insight on this pilot program will give the USDA all the information they need to make the most effective use of these new and innovative funds. Submissions and comments were due to the USDA by Sept. 10, 2018. Consumer sourcing and leveraging R&E networks to become Collaborative Networked Organizations, or CNOs, to manage the collection of broadband availability data could improve the quality and accuracy of the information, according to comments submitted to the NTIA this summer. NTIA, on behalf of the U.S. Department of Commerce, requested comments on actions to improve broadband availability data, particularly in rural areas, as part of the national activities directed by the Consolidated Appropriations Act of 2018. Comments were due on July 16, 2018. In total, 52 individuals and organizations submitted official comments this summer. The Quilt had the pleasure to work our member Merit, Michigan’s R&E network, and the Quello Center at Michigan State University, to craft a joint comment on how to enhance indicators of broadband access. Much of America has enjoyed the benefits of broadband for years, but there are still areas of the country that don’t have the level of connectivity needed to keep up with modern society. According to the FCC, more than 30 percent of rural Americans currently live in areas that lack availability of broadband, which since early 2015 has been defined by the FCC as 25 Mbps down, 3 Mbps up. Through this request, the NTIA seeks input from a broad range of stakeholders on ways to improve the nation’s ability to analyze broadband availability, with the intention of identifying gaps in broadband availability that can be used to improve policymaking and inform public investments. According to Bill Dutton, Director of the Quello Center, the comments provided on behalf of Merit and Quello offer an innovative approach to consumer sourcing of broadband availability data that builds off the FCC’s initiatives with crowd sourcing. It also leverages the strategic advantages of Merit, and the possibility of extending to other R&E networks that are members and affiliates of The Quilt. The Quilt will be returning to the La Jolla Shores Hotel and La Jolla Beach and Tennis Club in California on Feb. 6-8 for its 2018 Winter Member Meeting. The Quilt will be holding its annual Winter Member Meeting at our traditional venue in La Jolla. We are looking forward to this in-person gathering of our national Quilt community and stakeholders to learn and share with one another in order to collectively advance networking for research and education. We have many exciting conversations and topics planned for you this year. We also have provided time between sessions for working lunch meetings and other networking opportunities. View Agenda. This year’s event kicks off with in-person meetings of our Quilt working groups as well as our Quilt Board of Directors. We’ll wrap up the day with a networking event. On Day 2, we start the day with various breakfast opportunities including our general breakfast gathering, our Quilt newcomers breakfast, the Carahsoft-sponsored breakfast for the Quilt VMware Program, and our Global NOC Users Group breakfast. The meeting’s general session begins at 8:30 a.m. with a highlight of the meeting which is our plenary panel on “Networks — Human and Telecommunications — in the CENIC Context: Perspectives from CENIC Charter Associates.” Other highlights include an Overview of Middle and Last Mile Wireless Access Solutions – Feasibility and Policy Considerations; Quilt Member Lightning Talks; National Broadband Policy Update; REN Network Security Briefs; Briefings from our R&E Networking Colleagues to the North (BCnet and Cybera); E-Rate and Other National Policies and Programs Discussion; and our Advanced Networking Sampler. At 5:30 p.m., our Quilt meeting reception begins on the Garden Patio at the Shores Hotel. Our dynamic program wraps up on Thursday with the NOAA N-Wave and RON Partner Breakfast followed by a round table discussion on friction-free networking for scientific research, a confluence of Quilt forums and a meeting of the InCommon Steward Program participants. We look forward to this week together every year in La Jolla. If you need further information about this year’s Winter Member Meeting, please contact Jennifer Griffin. Follow all conversations on social media using #QuiltinSoCal. There is concern that rolling back net neutrality protections will have a negative impact on access to information and services vital for our schools, community colleges, universities, health care institutions, and other members of the research and education community. The Quilt is a national coalition of Research and Education Networks, or RENs. The Quilt has always been and remains committed to supporting the missions of our member networks and will continue working to support the efforts of RENs to ensure that open access delivery models remain available to all stakeholders. Essential to our members are the concepts of transparency and control. As nonprofits, RENs are governed by boards and advisory committees made up of constituents who set the policies that determine how services are delivered. RENs do not block or discriminate against any legal applications or content traversing their networks and provide their user communities with operational visibility. RENs are committed to making all of the Internet available to all users, and use a number of techniques to ensure the Internet performs well for users and does not limit access to services and content they desire. The Quilt conducts a rigorous RFP process to choose qualified vendors of Internet service that includes assurances that the full Internet is accessible, service is reliable, and prices are low. The Quilt’s 2018 Commodity RFP schedule and key milestones can be found here. Additional information and details are available in this announcement. RENs also make direct “peering” connections with content providers where large amounts of traffic are exchanged. RENs and Internet2 also expand their peering capabilities with additional peering arrangements available through their networks. Additionally, content distribution networks operated by Akamai, Netflix and others are hosted inside REN networks to improve performance and access. It is this comprehensive, cost-conscious approach to maintaining great networking performance, reliability, and access that make RENs so special. When the R&E community originally built the Internet, the principle of a free and open network was a key component to the innovation and evolution that led to the Internet as we know it today. Without it, we could not have created a network community of equals across different disciplines among the private and public sector worldwide. It is clear any change to that fundamental principle will change inter-networking which is why our primary focus is to make sure that the research and education community participates in a global Internet in an unrestricted capacity for all innovators. Thank you for joining us in Albuquerque for the 2017 Fall Member Meeting. Building on the success of the colocation of Fall 2015 and 2016 events, this year’s Fall Member Meeting also coincided with the National Science Foundation Campus Cyberinfrastructure and Cybersecurity Innovation for Cyberinfrastructure PI Workshop and the ESnet Site Coordinators Committee Fall Meeting (ESCC). Some of the best networking minds in the country gathered in the southwest desert for some exciting discussions on how R&E networks are uniquely positioned to meet today’s infrastructure challenges to support researchers in their scientific discovery. Thank you once again to Quilt Member, the University of New Mexico Albuquerque GigaPoP, or UNM-ABQG for inviting us to New Mexico. This was one of our most dynamic programs to date! The meeting started off with an impressive plenary from Dr. Raymond Newell of Los Alamos National Laboratory on cybercryptography followed by excellent regional cyberinfrastructure collaborations panels from Texas and New Mexico to support scientific discovery. Additional highlights include plenaries from Jack Brassil of the National Science Foundation and Louis Fox from CENIC, and panel discussions showcasing our R&E networking communities collaborative approach to cyberinfrastructure workforce development, connecting public libraries, and others. Below we have captured and curated many of the social media conversations that were happening throughout the event. 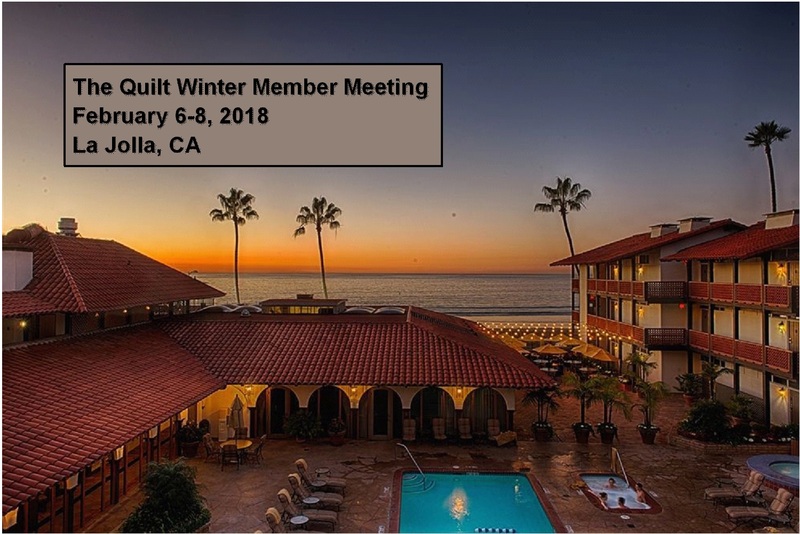 We hope you enjoy this recap and the information provided, and we’ll see you again on Feb. 6–8, 2018 for our 2018 Winter Member Meeting in La Jolla, Calif.
Our 2017 Fall Member Meeting is only a few weeks away, and we have a great program lined up for Quilt members, affiliates and guests inside the Hyatt Regency – Downtown Albuquerque on Oct. 3-5 in New Mexico. At the invitation of our Quilt member, the University of New Mexico Albuquerque GigaPoP, or UNM-ABQG, The Quilt is very excited to have our community gather in the desert southwest to learn, share, and collectively advance networking for research and education. Building on the success of the colocation of Fall 2015 and 2016 events, this year’s Fall Member Meeting also coincides with the National Science Foundation Campus Cyberinfrastructure and Cybersecurity Innovation for Cyberinfrastructure PI Workshop and the ESnet Site Coordinators Committee Fall Meeting (ESCC). Some of the best networking minds in the country will be gathered all in one place for some exciting discussions on how R&E networks are uniquely positioned to meet today’s infrastructure challenges to support researchers in their scientific discovery. The draft program agenda for The Quilt Fall Member Meeting is available here. Highlights include a joint networking reception, plenaries on Quantum Cryptography, cyberinfrastructure investments, discussions on regional research platforms and scaling a national research platform with additional highlights from the first NRP Workshop in Montana this summer, US UCAN and Quilt member collaborations on the Institute of Museum and Library Science (IMLS) Grant and Toolkit, advanced networking and big data, Science DMZs, lightning talks, cybersecurity, and more. This is one of our most dynamic programs to date! We are looking forward to the opportunity to bring all these groups together, and thank you once again to our Quilt member UNM-ABQG for inviting us to Albuquerque. You can follow the conversation now and throughout the meeting using #QuiltinABQ or @TweettheQuilt. We look forward to seeing you ABQ!